Artistic design of the "superearth" GJ 536 b and the star GJ 536. Credit: Gabriel Pérez, SMM (IAC). Ph.D. student Alejandro Suárez Mascareño, of the Instituto de Astrofísica de Canarias (IAC) and the University of La Laguna (ULL), and his thesis director, Rafael Rebolo and Jonay Isaí González Hernández, have discovered a "superearth"-type planet, GJ 536 b, whose mass is around 5.4 Earth masses, in orbit around a nearby very bright star. The study has been accepted for publication in the journal Astronomy & Astrophysics; researchers from several countries are involved. This exoplanet orbiting the star GJ 536 is not within the star's habitable zone, but its short orbital period of 8.7 days and the luminosity of its star, a red dwarf which is quite cool and near to our sun, make it an attractive candidate for investigating its atmospheric composition. During this research, a cycle of magnetic activity similar to that of the sun has been observed, but with a shorter period, three years. "So far, the only planet we have found is GJ 536 b, but we are continuing to monitor the star to see if we can find other companions," says Alejandro Suárez Mascareño, who is the first author on the article. "Rocky planets are usually found in groups," he explains, "especially around stars of this type, and we are pretty sure that we can find other low-mass planets in orbits further from the star, with periods from 100 days up to a few years. We are preparing a programme of monitoring for transits of this new exoplanet to determine its radius and mean density." "This rocky exoplanet is orbiting a star much smaller and cooler than the sun," says Jonay Isaí González. "But it is sufficiently nearby and bright. It is also observable from both the northern and southern hemispheres, which is very interesting for future high-stability spectrographs, and in particular, for the possible detection of another rocky planet in the habitability zone of the star." "To detect the planet", says Rafael Rebolo, "we had to measure the velocity of the star with an accuracy of the order of a metre per second. 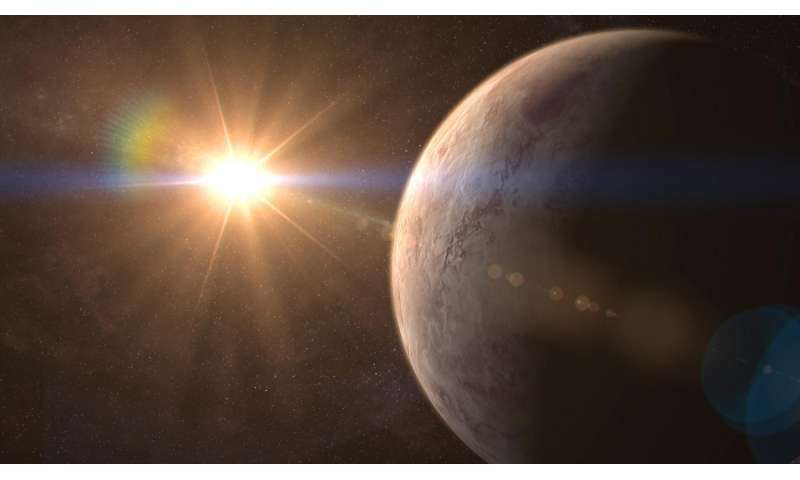 With the construction of the new instrument ESPRESSO, co-directed by the IAC, we will improve this accuracy by a factor of 10, and will be able to extend our search to planets with conditions very similar to Earth, around this and many other nearby stars." The planet has been detected in a joint effort between the IAC and the Geneva Observatory, using the HARPS (High Accuracy Radial velocity Planet Seeker) spectrograph on the 3.6M ESO Telescope at La Silla (Chile) and HARPS North, on the Telescopio Nacional Galileo (TNG) at the Roque de los Muchachos Observatory, Garafia (La Palma). Watching the entire zodiac in a week. I guess you could actually see the stars move, and they would slow down and speed up with orbit vs rotation. Wonder what sort of religion they would have? They would be relatively immune to vertigo. If they live on the daylight side they've probably never seen the stars. This world almost has to be tidally locked. If the life is chemosynthetic, and lives on the dark side for protection from stellar radiation, it may not have eyes at all. Unless it was bioluminescent, there wouldn't be any evolutionary use for eyes. As far as vertigo, the planet would be rotating much slower than Earth, so the sky would appear to move more slowly than ours. The dark side would see it move continuously, unlike here, where it's interrupted by the Sun every day. Well of course youre right. If its locked. We see the entire zodiac in a day. If it is tidally locked, its rotation would not be zero. Even a slow rotation would eventually mean a day and night cycle, however long. I tend to have trouble with absolutes, and tidal locking forces would slow the affected worlds down progressively slowly as the tidal forces would diminish in effectiveness progressively as the planet slowed, like Zeno's Paradox. For those who do not know Zeno, a Greek, and his paradox, look it up on this big city of a net. Make a good differential equations problem in multiple dimensions. Think about it. What is the point of calling a planet with 5 times the mass of Earth a "Superearth"? What sort of stupidity leads to that? A super-Earth is an extrasolar planet with a mass higher than Earth's, but substantially below the mass of the Solar System's ice giants Uranus and Neptune, which are 15 and 17 Earth masses respectively. The term super-Earth refers only to the mass of the planet, and does not imply anything about the surface conditions or habitability. The alternative term gas dwarfs may be more accurate for those at the higher end of the mass scale, as suggested by MIT professor Sara Seager, although mini-Neptunes is a more common term. If their bodies are exothermic there would be an evolutionary advantage in eyes that see infrared.